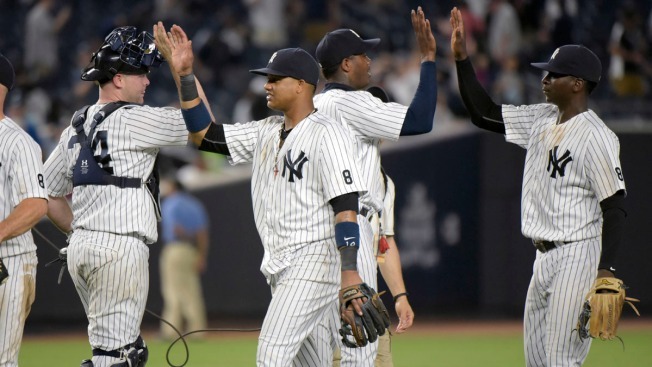 FILE: Brian McCann, Starlin Castro, Aroldis Chapman and Didi Gregorius on July 18, 2016. Luis Severino (13-6) allowed three hits in eight innings with seven strikeouts and one walk. He made one big mistake, Welington Castillo's opposite-field, two-run homer to right that put the Orioles ahead 2-1 in the second. Severino is 8-2 with a 2.09 ERA in 12 starts since the All-Star break. David Robertson finished with a hitless ninth. Gregorius hit a sacrifice fly in the first, homered against Miguel Castro for a 4-2 lead in the fifth and added another sacrifice fly in a three-run seventh. He has set career highs with 22 homers and 77 RBIs. Greg Bird added a home run into the right-field second deck, giving the Yankees 141 runs in 17 games against Baltimore this season. New York, which began the night three games behind AL East-leading Boston, matched its season high of 15 games over .500, set in mid-June. The Yankees started three games ahead of Minnesota for the top AL wild card. New York (81-66) needs one victory to ensure its 25th straight winning season, the second-longest streak in big league history behind the Yankees' 39 in a row from 1926-64. Baltimore (72-76), which began 5 1/2 games behind the Twins, lost for the eighth time in nine games. Gabriel Ynoa (1-2) allowed three runs - two earned - and five hits in 4 1/3 innings. He walked Aaron Judge with one out in the fifth and the score 2-2, and Castro gave up a two-out homer to Gregorius. The major leagues' most-used reliever in the second half of the season, Castro has allowed runs in four straight appearances. Errors by first baseman Chris Davis and second baseman Jonathan Schoop led to three unearned runs. Judge walked twice and struck out twice. With 195 strikeouts, he matched Curtis Granderson's Yankees season record, set in 2012. Robertson threw a pair of wild pitches, raising the total with Gary Sanchez behind the plate this year to 49. New York's Brett Gardner gave a look to Castillo after sliding into him when scoring on Gregorius' seventh-inning fly, apparently angry Castillo blocked the plate before he had the ball. Bird reached down to snag Austin Hays' spinning five-hopper in the third, and the first baseman made an off-balance throw from foul territory to a sprinting Severino that denied Hays his first big league hit. Orioles manager Buck Showalter joined Paul O'Neill, Willie Randolph, David Cone and Yankees manager Joe Girardi in placing flowers at home plate at the start of a tribute to former Yankees manager and executive Gene Michael, who died last week. Michael hired Showalter for his first big league managing job. Orioles: CF Adam Jones was given the night off, sore after three games on artificial turf this week at Toronto. ... SS J.J. Hardy, yet to play since he was activated Sept. 8 after more than two months on the DL with a broken wrist, is likely to start Saturday or Sunday. Yankees: OF Aaron Hicks, out since Sept. 2 because of a left oblique strain, took swings without a ball and then left early because of strep throat. LHP Jordan Montgomery (7-7) starts Saturday for the Yankees and RHP Jeremy Hellickson (8-9) for the Orioles.